Here’s the recipe. It makes me feel like Christmas has swept me off my feet and lit a fire in the fireplace…..ahhhhh….. Melt butter in heavy large saucepan over medium-high heat. 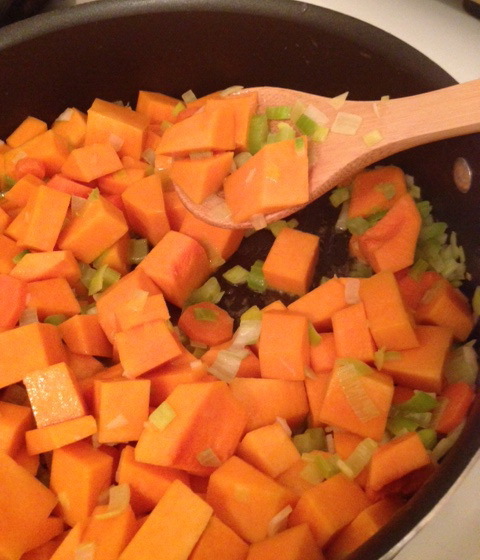 Add squash, leeks, carrot and celery; sauté until slightly softened, about 15 minutes. Mix in apples, thyme and sage. Add stock and 1 cup cider and bring to boil. Reduce heat to medium-low. Cover and simmer until apples are tender, stirring occasionally, about 30 minutes. Cool slightly. Working in batches, purée soup in blender. Return soup to pan. Boil remaining 1/2 cup cider in heavy small saucepan until reduced to 1/4 cup, about 5 minutes. Cool. Yields 10 servings….so they say….but what’s a serving? 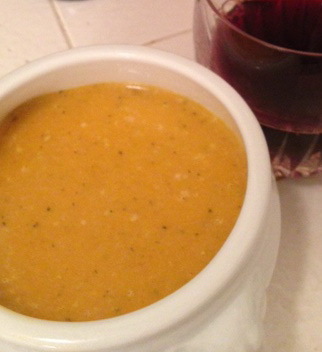 I may have had 2 bowls tonight….but that was my serving. Don’t tell anyone.